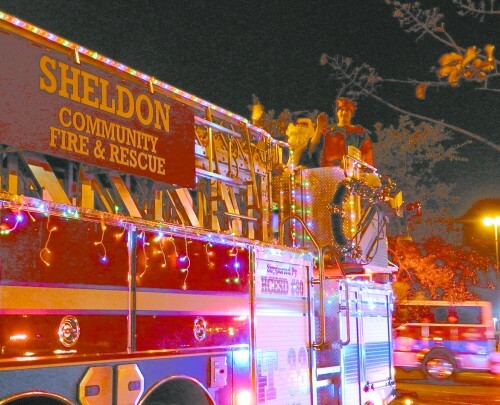 SANTA and his Elf helper arrived on a Sheldon Fire Department ladder truck, decorated for the Holiday Season with lights and Christmas greetings. NORTH SHORE – Ho Ho Ho, Santa came to the North Shore communities, riding a Sheldon Fire Department truck, last Friday night, December 20th. The event was originally scheduled for the week before, but rain and cold weather forced the delay for Santa. The parade route was determined so that the most communities in the area could see Santa’s arrival and the decorated emergency vehicles without having to drive and park a distance from their homes. Sheldon Fire Chief Sidney Webb and his wife, and North Channel Assistance Ministries directors Rodney and Gail Redford planned the route. The parade started at Holly Park, at the Sheldon 9th grade school, headed south on Freeport Street, turned east on the I-10 frontage road, turned north on Sheldon Road, turned west on Woodforest, and ended at the Kroger store at Normandy and Woodforest Blvd. Families lined the route for most of the way, and you could hear the sirens and see the lights for many blocks in the distance as they approached. EMERGENCY VEHICLES are on the scene of a shooting in the 900 block of Ashland Road, near Elgin Street in Channelview. They found one person wounded and lying on the ground. Four others were later found at East Houston Medical Center with various wounds, and investigators believe all the injuries are related. CHANNELVIEW – Investigators for the Sheriff’s department are trying to learn the reasons behind a multiple shooting that took place on Sunday, Dec. 15th at about 2:30 pm in the afternoon. Deputies who responded to the call found a man lying in a front yard of the street, with a gunshot wound, according to Sheriff’s spokesperson Lt. Thomas Gilliland. This victim was transported by LifeFlight helicopter to Memorial Hermann hospital in the medical center. He was reported to be in stable condition. Shortly after the deputies cleared this scene, they learned that four other young men had been transported to the nearby East Houston Medical Center by private pickup truck, with similar injuries. All were in stable condition, however. 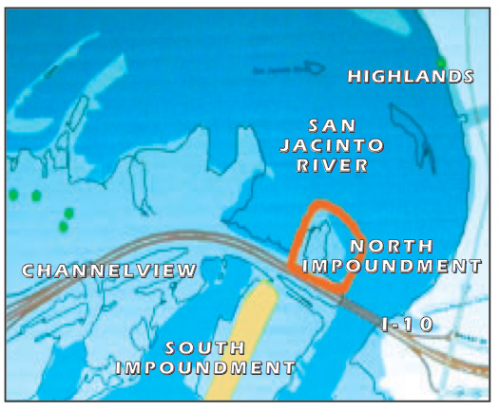 MAP OF THE SAN JACINTO TOXIC WASTE PITS as furnished by the Texas Commission on Environmental Quality, and the US EPA, show the confirmed North Impoundment Superfund Site, and the suspect- ed South Impoundment site. HOUSTON – Members of a group known as the San Jacinto River Coalition, as well as the TexansTogether organization, staged a demonstration last Wednesday, Dec. 18th to protest the inaction of parties involved in the clean-up of the toxic waste pits in the San Jacinto River near Channelview and Highlands. These pits, which are the result of dumping of industrial waste from the paper-making process some 40 years ago, contain dioxin, which is considered by some health experts to be the most deadly compound in existence. The dioxins have been leaking into the river water, and fish and blue crabs absorb them and make them deadly for human consumption, say the experts. The county has posted warning signs, but many fisherman ignore them. Harris County Attorney Vince Ryan has sued the companies that now are responsible for the cleanup. These are Waste Management, successor to McGinnes Industrial Maintenance Corp., and International Paper, which is the successor to Champion Paper Co. whose paper mill generated the waste. The bowl season is well underway, but the big games begin on New Year’s Eve when Texas A&M faces Duke in the Chik-fil-A Bowl in what could be Johnny Manziel’s final game for the Aggies. Locally, both Rice and the University of Houston will be bowling this season as the 10-3, Conference USA champs Owls will face Mississippi State in the Liberty Bowl on New Year’s Eve, while the 8-4 Cougars will also be facing a SEC team when they face Vanderbilt in the BBVA Compass Bowl on Jan. 4. The Big 12 champion Baylor Bears will be playing in their first BCS bowl ever when they face 11-1 Central Florida in the Fiesta Bowl. But the game everybody is waiting for will be the BCS Championship game, which will pit No. 1-ranked Florida State and Heisman Trophy winner Jameis Winston against No. 2-ranked Auburn and their potent run offense. Auburn was one of the best stories of the 2013 season. The Tigers were coming off a 3-9 season in 2012 and had a new head coach in Gus Malzahn. Malzahn installed his run-happy offense and the Tigers piled up gaudy numbers en route to an 11-1 season, which included two last-second wins over Georgia and Alabama that saved their season. While Auburn was pulling out heart stoppers, Florida State pretty much dominated every team they played on their way to a 13-0 season and the Atlantic Coast Conference title. Winston was a threat with his arm and his legs, but this team is not a one-man show. There is talent on both sides of the ball and it appears head coach Jimbo Fisher has brought the Seminoles back to being one of the top teams in college football as they were for decades under former head coach Bobby Bowden. There should be a lot of good games to watch over the next week for college football fans, but before we take a look at what’s on tap, let’s review last week’s record. A 5-4 record brought the season record to 116-61 (66%). Now, let’s see what the bowl season has to offer.